Manoj Govindraj will be featured with a live set of Hindustani vocals in Raag Aur Tal this Sunday, August 5th at 7pm. Be sure to tune in for this performance recorded in WKCR on the 14th of July. Manoj Govindaraj (vocals), Swarup Swaminathan (harmonium), Sai Shyam Mohan (tabla) Manoj Govindaraj trained under Mrs. Vineeta Tembe, Pt Prabhakar Karekar and Mr and Mrs. Prem. Manoj has 1st rank in Masters in Performing Arts from Bombay University. Manoj is the receipient of several awards, the most prestigious amongst them being the Sur Singar Samsad Award in 1995 and Pt. Bhimsen Joshi Scholarship. 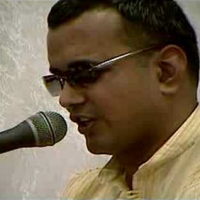 Manoj is currently faculty at the Academy of Indian Music (AIM), NJ for Hindustani classical vocal, light vocal like Bhajans/Ghazals and Harmonium. Manoj performs at concerts and private gatherings Hindustani Classical vocal, Bhajans, Ghazals and Semi Classical performances. Swarup Swaminathan has been learning the rare art of Hindustani solo harmonium for the past six years under the tutelage of Dr. Kedar Naphade, a foremost disciple of the renowned artist Pandit Tulsidas Borkar. Swarup previously learned tabla from Sri Arun Bhowmik and Pandit Samir Chatterjee for seven years. Swarup has given solo performances at several tri-state area venues such as the Indian Consulate in New York and Art of Living Foundation in New York City, accompanying renowned artists such as Vidushi Subhra Guha, Smt. Vani Jairam, Sri Sanjoy Banerjee, and Pandit Nagaraj Havaldar. Swarup is a two-time recipient of the New Jersey State Art Council's Folk Arts Apprenticeship Grant and was the first-place winner of the 2003 Sangeet Rajani Young Musician Award from the Indian Academy of Performing Arts, New Jersey. He has also served as the director of the world music department at WKCR Radio 89.9 FM at Columbia University. Sai Shyam Mohan was initiated into tabla at the age of 5 by Sri.K Prashant Paramjyothi, and is currently studying under Sri. Abhiman Kaushal, a foremost disciple of Ustad Shiek Dawood Khan Saab. Sai Shyam has been studying and playing Tabla for more than 20 years and has given many performances across the US and India and has had the honor of accompanying artists like Smt. Lakshmi Shankar, Ustad Rais Khan, Ustad Shahid Parvez, Gaurav Mazumdar, Pandit Nagaraj Havaldar, Pandit Madhav Gudi and Pandit Vinyak Torvi to name a few.Also he has accompanied Carnatic artists like Mysore Manjunath & Nagaraj, Ranjani & Gayatri, Lalgudi GJR Krishnan and Whistle Wizard Sivaprasad. He has had the privilege of receiving the New Jersey State Apprenticeship Award three times for further development of his tabla education. He also teaches at the Chinmaya Mission Cranbury center for past 3 years.